Hurricane Florence was a threat to Charleston, S.C., where I live — and where my 91- and 93-year-old parents’ retirement center is — so when the South Carolina governor issued a mandatory evacuation in September 2018, we had to head inland. I lost everything I owned 29 years before in Hurricane Hugo, so I didn’t even consider staying home! The night before we planned to leave town, I (and everyone else) had to fill the car with gas, so after work I went to a gas station on the way home that (surprisingly) didn’t have a line of cars. Pulled up to the pump, put in my credit card info and tried to pump gas, but, unfortunately — the pump was empty. Then when I backed up to try another pump… I bumped into a woman’s car who pulled in behind me and thought I saw her. 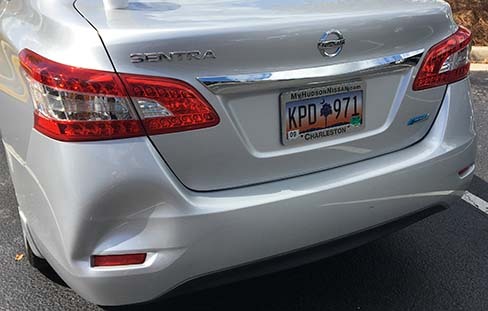 Fortunately, her car didn’t appear to be damaged — and she was very nice — but she pointed to my car and asked, “Did you always have that dent there?” I didn’t — and now had a big dent just above the tail light. I left that gas station and had to go to five others before I could finally fill the tank — and arrived home about 8 p.m. hungry and discouraged. My parents’ retirement center closed the night before we planned to evacuate, so I’d painstakingly made a list of everything to pack a few days before that and brought suitcases to them. When I arrived to pick them up, they’d not only lost the list I made, but had only packed a few things. In my mind, the most important items to pack were their medicines (luckily, they don’t take many), medical equipment and toiletries, and enough clothes for four or five days. Once we got everything packed, they came to my house to spend the night. Because the bedrooms are upstairs (and I didn’t want them to go up and down the staircase), they slept on a pull-out sofa bed and used the half-bath on the first floor. That actually worked out better than expected, because everyone else was headed out of town and we were in and out in about an hour! 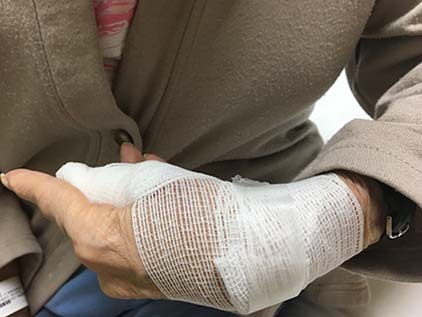 Luckily, Mom didn’t have gangrene like I envisioned — and the doc said to put neosporin on her thumb and wrap it in gauze. After a quick trip to the grocery store (the drugstore had closed for the hurricane), we got supplies and were able to leave town about 9:30 a.m. The drive inland went well, since all lanes of traffic on the interstate were headed out of town; the lane reversal really helps to reduce traffic delays in evacuations. The drop-off was definitely not safe for occupants over 90! 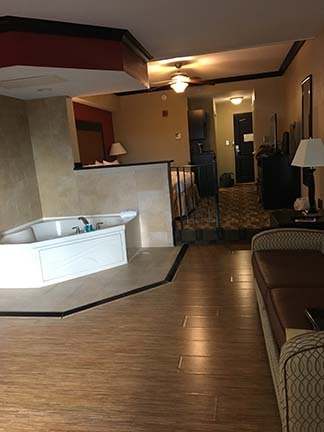 When I called the front desk to see if we could switch rooms, the clerk said every room in the hotel had the same layout except for handicap-accessible rooms; fortunately, someone had cancelled and they had one available on the first floor. 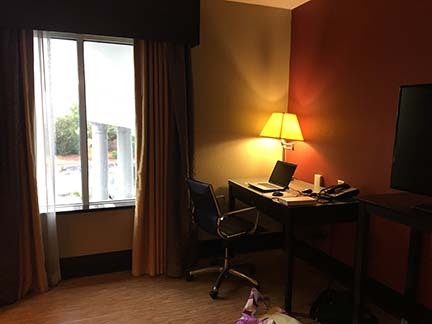 We moved all our things to the new rooms — which was much easier than moving to a new hotel. Everything worked out OK with communications, though, because I’d go see them at the free breakfast buffet every morning, tell them I’d be back at noon to see about lunch, and go up to my room to work. I’d go get lunch, then tell them I’d be back at 5 for dinner, and go up to my room to work more. 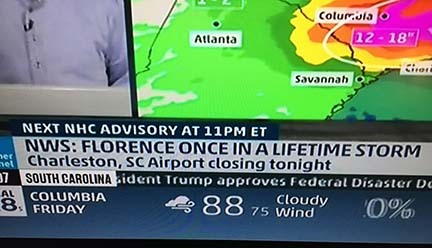 I kept an eye on the weather channel all day, too, because this hurricane was so unpredictable. 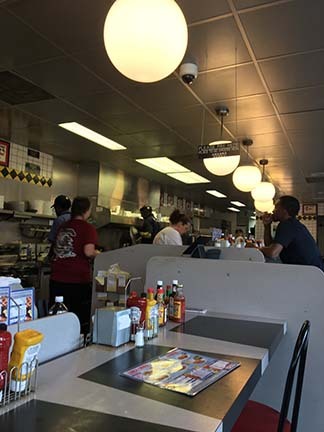 We went out to dinner at area restaurants several nights until the weather got bad, and then I made runs to the Waffle House across the parking lot from our hotel. We also snacked on the bags of bread and peanut butter, crackers, granola bars, etc. that I’d brought in case the power went out. We had one other incident, though. After two days at the hotel, mom asked me if I knew where her purse was — because she wanted to put on lipstick from it. The last place I remembered seeing it was their apartment, and at that point, all we could do was wait til we got home to see if it was there. In the meantime, we went to Walmart, got her new lipstick, and she was happy. A day or two later, someone called me from the hotel front desk and wanted me to come down for “something about my parents.” I nearly freaked out thinking something terrible had happened to them — and they assured me it hadn’t. When I got to the front desk, the clerk showed me a blue purse and asked me if it was my mother’s. It was! Apparently we’d left it in the original hotel room when we moved to the new room. I was blown away by their kindness in returning it intact with money and identification — and in taking the trouble to track us down, since the rooms were in my name and they had no record of my parents’ names! That was a real blessing. When you evacuate, sometimes the weather in the city you flee to is as bad as, or worse, than where you came from. In this case, Columbia had rain and breezy weather for several days and many nearby restaurants and stores closed there for the hurricane. 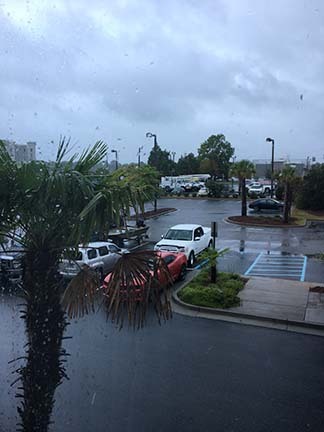 When we returned home five days later, it rained all the way home — and the sun came out half an hour from Charleston. Everyone at home told me it had hardly rained. My house was intact and my parents’ community was, too — but it still hadn’t opened when we got home Sunday morning, so they stayed overnight at my house one last night, and I took them home the following day after I got home from work. 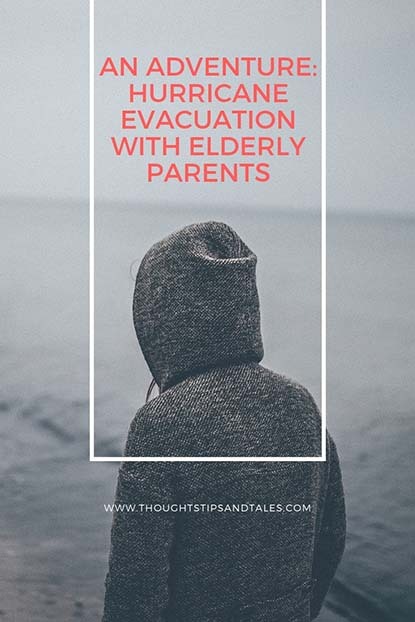 Evacuating with elderly parents was definitely an adventure…and it took me several weeks to recover from it! This entry was posted in hurricane, life and tagged elderly parents, evacuating with elderly parents, hurricane evacuation, hurricane evacuation with elderly parent. Bookmark the permalink. I’m so glad it went well and you are all good and safe. You are the best. You made an entertaining story out of such a harrowing experience. Your parents are real troopers, too. Glad everything was ok when you got home. Take care. Thanks for the kind words! My parents are definitely troopers – they just had their 69th wedding anniversary! It’s a horrible experience but thank you for sharing it. So happy everything went well for all of you. Indeed there are a lot of unexpected things to expect (do i make sense hahaha) when a natural calamity happens. Wishing you all well.